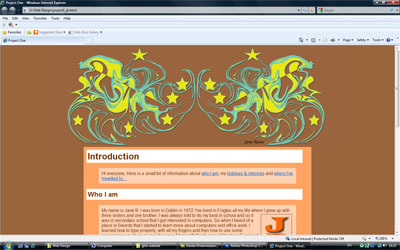 This is my first web page with my own design of the background at the top of the page. I started the web design course only last year and have found it quite challenging at times in trying to remember all the different codes and tags but I have enjoyed the experience all the same. This web page is a bit about myself, my hobbies & interests and where I've travelled to. This is a photo gallery display of unplanned Images of the Liberties and the Quays of Dublin with Architectural Places of interest that I took with a digital camera. This is my media assignment were I used a camera phone to take the two video files and I also added one audio extract only containing a poem called "This Morning" by Orlando Belo. This is a website with a six page content from project one. This is my version of Project_3_1 for the web site of Megannety Osteopathy & Acupuncture Clinic in Co. Wicklow. The prototypes and wireframes for this web site can be found here.